Toyota replaced the compact V20 Camry with the Japanese market-only V30 series in 1990. However, international markets such as Australia and North America received a widened version of the V30, known as the XV10 series. While marginally larger than the V20, the V30 had to comply with Japanese tax legislation which restricted the car's width to 1,700 millimetres (67 in) and length to 4,700 millimetres (190 in). Particularly in the United States, this narrower model was seen as compromised, thus limiting its sales potential. As a result, the "wide-body" mid-size Camry (XV10) was designed. The XV10, at its most basic level, offered a 2.2-liter 5S-FE four-cylinder engine, up from 2.0 liters in the V20 and V30 Camrys. This unit produced 97 kilowatts (130 hp) of power and 197 newton metres (145 lb/ft) of torque, although the exact figures varied slightly depending on the market. Power and displacement increases were also received for the V6 engine. The 3.0-liter 3VZ-FE unit was rated at 138 kilowatts (185 hp) and 264 newton metres (195 lb/ft). An all-new aluminium 1MZ-FE V6 debuted in North American models from 1994, with other markets retaining the 3VZ-FE V6. Power and torque rose to 140 kilowatts (190 hp) and 275 newton metres (203 lb/ft), respectively. The XV10 Toyota Camry was available with 3 engine types, the 4 cylinder 5S-F3, 6 cylinder 3.0L 1MZ-FE and the 6 cylinder 3.0L 3VZ-FE. This guide explains procedures suitable only for the 3VZ-FE V6. 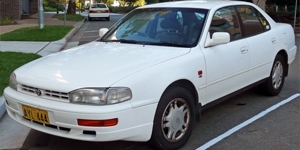 A common problem for owners of the 3VZ-FE V6 Camry is mainly due to their knowledge of older conventional cooling systems, the location of the thermostat on this Camry is different to many older cars. As with basically all cars, you can follow the main radiator hose to find the thermostat housing, however being a sideways mounted engine and most people being used to finding the thermostat on the actual intake manifold means they can become confused, as they believe the location where the water hose leads to must be wrong. I'll explain below where to find the thermostat and how to replace it. Read all of the below before even considering changing the thermostat yourself, also always read the cooling section of the vehicles workshop / repair manual before you start, the below is simply a guide to the common issues people have when changing the thermostat, you should not solely rely on this as the main source of repair information. If you are not confident in any aspect of this repair, pay a mechanic to do this for you, it will probably only cost around $100 labour and could save you a lot of money should you get the process wrong. Before you begin, make sure you go to an automotive shop and purchase a brand new replacement thermostat, ensure this also comes with a round rubber ring which is the seal you will need to replace at the same time, reusing an old seal, forgetting to install the seal and ignoring the seal and using liquid silicone will result in serious leakage of the cooling system and could overheat and damage your engine, always use a brand new seal each time for these cars. Another important thing to remember is that the rubber water hoses used for the radiator to transfer water are actually a consumable part, they should not be reused and each time they are removed they should be replaced with brand new hoses, these will be available from your local automotive parts supplier. Remember to get new round hose clamps to replace the old ones, the same automotive store will sell these. As the rubber hoses are connected to metal fittings, these metal fittings can build a lot of temperature and as such seal the hose onto the outlet, this is why you can have trouble removing them sometimes as they have fused onto the metal, they usually have also taken the shape of the water outlet, so breaking the seal that has formed can damage the hose. Replacing them with new water hoses does not cost much money and will lower the chance of cooling problems following the cooling system repairs. Now get some gloves (rubber dish-washing gloves are usually handy) and firstly ensure the cars water system is cool, if you have driven the car within the last 2 hours, let it sit until the 2 hour mark has passed, following this, use a thick rag to remove the radiator cap (do this slowly) just in case the system is still pressurised and the water is still in the warm - hot range. If water begins to leak while you are removing the cap, tighten it again quickly, drop the rag and remove yourself away from the radiator source, if the cap has already released and you believe it can't be tightened, then drop the rag and move away to let the pressure vent. The system operates at around 180F degrees (82c), the normal temperature to cause rapid skin burns is 150F (65c) and above. For this reason if it is a warm day even after 2 hours the water may still be this temperature. Once the cap is off, quickly test the temperature of the water, a thermometer is best for this. Lower it into the hole where the radiator cap previously was so the temperature sensor touches the coolant / water. If the temperature is lower than 130F (55c) then you can proceed to drop the lower radiator hose and drain the water, you may want to drain the water into a bucket as the coolant / water contains many minerals and metal oxides (rust) which can easily stain concrete. Now this is done, you can locate the thermostat. The thermostat location on these cars is actually mounted to the water pump assembly. The water pump is located at the lower front of the engine, towards the inlet side, it is not mounted on or even near the actual intake manifold like most people would expect. Look to the lower left of the engine front and you will see the water pump assembly. If you are still having trouble, remember the water pump is actually extremely low, only just above the engine oil sump. You will notice the alternator near the top right, the water pump is about 30cm lower than this, from the alternator look to the bottom of the engine, then look left and you will see the water pump. Now to the lower right of the water pump assembly you will see a metal water pipe with a temperature sensor mounted on top, this is the thermostat cover (water inlet). First remove the circular clamp holding the water hose to the water inlet, get a bucket ready underneath this then remove the hose by twisting it up and down gently until it comes away from the metal pipe, hold this hose downwards towards the bottom of the car and drain all the water out. After this you can remove the water inlet, 3 bolts secure this in place, one at the top, one at the bottom and one on the left side in the middle. When you remove the water inlet cover, the thermostat will either come out with it, or remain sitting inside the engine, get a flat head screwdriver and place this into the gap at the top of the thermostat and very gently lever it out. Following this, take the water inlet and in the section where the thermostat sits, use a wire brush to gently remove any rust or contamination which has built up, following this you can install the new round rubber seal that came with your thermostat. Now lightly brush the front of the water pump around where the water inlet will bolt back on. After this you can install the new thermostat and reinstall the water inlet to the water pump assembly. Once you have done that, install new top and bottom radiator hoses (ensure they are properly fitted, the hose should be placed over the metal pipes as far as possible) and tighten them using your new round hose clamps (make sure the clamps are clamping the hose to the metal pipes and not sitting on the edge or missing the metal pipes), these need to be tightly fastened. Now you will be able to fill the radiator with new coolant and once full run the engine while the radiator cap is STILL REMOVED. Stand at the front of the car with more coolant ready, as the engine runs it will heat up until it eventually reaches operating temperature (82c), following this the thermostat opens and releases the contents of the radiator into the engine, this will cause a sudden and rapid depletion of coolant from the radiator. At this point you are dealing with hot water from the cooling system, so take care not to be burnt. You now need to begin filling the radiator with more coolant straight away until it is once again full, keep watching the water levels, if the level goes down again, top it up once again. Once the water level has remained stable for 10 minutes the system should now be completely full with water and free from major air pockets. Fit the radiator cap again tightly and also fill the plastic coolant reservoir to the specified high level with coolant. Following this, place the coolant bottle in the car and go for a drive around the block a few times, if the water temperature gauge remains at or below half way for 10 minutes of driving you should now have successfully replaced the thermostat and returned your cooling system to a working operational state. Should the temperature begin to pass half way (1/2 level), pull over straight away, if the temperature gauge is still below the 3/4 level, turn the engine off. If it is above the 3/4 you should not turn it off because the heat level has already become too hot and turning it off may cause head gasket damage (in this case you will need to act very fast). Pop the hood (bonnet) of the car and top up the coolant reservoir once again, also visually check there is no leakage from the radiator cap. NEVER REMOVE THE RADIATOR CAP AT THIS POINT! The water will be around 100c at this point and will cause extreme burns, if the cap is slightly leaking, while still wearing gloves and with a rag tighten the radiator cap so it is secure, make sure you do not loosen it by mistake as the system is now under high pressure and will surge boiling water at you if you remove or loosen the cap. Now you can place your head under the front bumper and look for any water dripping out, if there appears to be a leak this is most likely from one of the rubber hoses. If you could not turn the engine off as mentioned earlier, you now have no choice in this matter and must turn the engine off, as you can not repair the hoses while the engine is running. Let the car sit for around 30 minutes then drive the car home (You should be absolutely no more than 10 minutes from home at all times until you are sure the coolant system is fully operational). Once home let the car cool for 2 hours then go about checking your fittings and correcting the problems you had earlier. For these reasons and to save yourself from engine damage, never take short cuts, always ensure the water inlet, water pipes and radiator cap are fitted and tightened securely at the time of fitting, doing this will ensure you do not end up with a leak and risk the possibility of engine damage.